Another BBC clasic has arrived on DVD just in time for Christmas in "A Christmas Carol" that is the 1977 BBC version of this memorable Christmas tale. 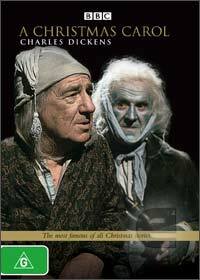 Featuring a variety of talented British actors that include Michael Hordern, John Le Mesurier, Bernard Lee, Patricia Quinn, Clive Merrison, Carol MacReady, Zoë Wanamaker, Paul Copley, Christopher Biggins, Veronica Doran and June Brown in one of the most memorable versions of this Christmas classic to date. For those unaware of the story "A Christmas Carol", it revolves around a miser named Ebenezer Scrooge who absolutely detests Christmas and believes that all his profits should remain his own. Unfortunately for Scrooge, he is visited by the Ghost of Christmas Past, Present and Yet to Come which takes Ebenezer on a journey he will never forget. Watching certain parts of his life from both the past and the future, these ghosts of Christmas help the old scrooge turn his selfish ways, much to the amazement of the village here he resides and his family. A Classic family Christmas tale that we would happily recommend to any family.